Chris McMullen always ferrets out what Amazon authors need to know. His blog is well-worth a follow. 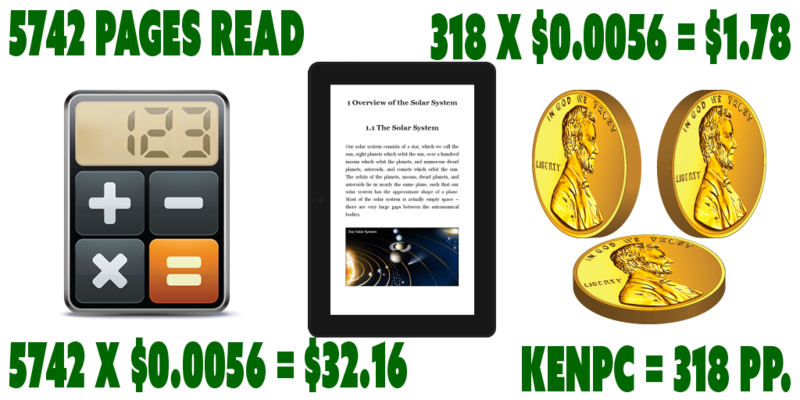 Just how does $0.0058 per page compare with the old system? Interpreting the value of pages read. How to figure out what your royalty is from your KENPC. Understanding the KENP read in your reports. Projecting what you will earn in July. How to make a spreadsheet to do the math for your KDP Select books. If you haven’t read Hugh Howey’s take on the new Kindle Unlimited policy, you should. The analysis is amazing, includes several excellent points that I haven’t read elsewhere, and even has proactive suggestions for illustrated children’s authors. Hugh Howey’s article (featuring math by author Susan Kaye Quinn), makes similar comparisons between the new and old Kindle Unlimited royalties and interpretation of the value of the projected $0.0058 per page.